I have written before about the shortage of STEM (Science Technology Engineering and Maths) graduates in the UK. I think a great deal of the reason that people don't choose to study these subjects is partly because they are perceived as hard, but also there is a perception that they are boring. This image of these subjects as hard and boring can overcome if you get to the roots of what a scientist is - an adult who never lost the curiosity in the world that a child has before they get indoctrinated to learn 'old facts' and not ask questions. There is also the problem that most people don't know what people in these professions actually do - I'm studying Oceanography as part of my degree - currently a section on seawater, and was surprised that by funny coincidence this happens to be what Matt is studying as part of his Masters degree in Engineering. volumes, weights, measures and strengths because they increasingly have no contact with real objects in their play. Children know how to swish a screen, but have no idea how to make a model that balances without falling over, or make estimates on whether a thing will be heavy or light, weak or strong. According to a lady I talked to in the summer who gathers information on such things, a growing number of children are now what would have been classed as 'developmentally delayed' in the 70's because they lack such instincts. Kids are afraid to try things out because they lack the confidence that would normally come from the repetitive play of childhood - handling objects, pouring liquids, building things. As usual the answer isn't rocket science (pun intended), it's play with real objects. 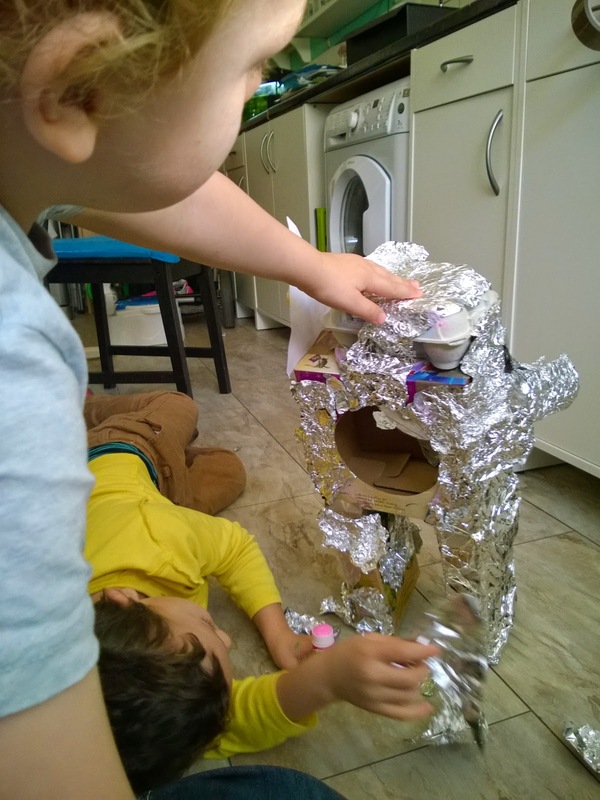 We have a long history in the UK (and as a species) of inventing things by tinkering about with materials, and this is at the heart of helping your child to develop their creative and scientific abilities. The process is really simple - start with a problem that you want to overcome (plus a box full of junk such as old cereal packets, and some glue and tape). In our case Ollie's problem was that he didn't want Daddy to go to work because he wanted him to stay home and build a tower with him. The solution he came up with was to invent a robot that could go to work and do Daddy's job for him. The boys worked cooperatively to put their robot together - Ollie in charge of the tape dispenser because Toby always loses the end of the tape, Toby in charge of putting tape everywhere. They quickly found that one off-center leg caused the robot to topple over, so they had to find another box the same size to give the robot two legs. Likewise with the arms - when they tried a big box for an arm the robot fell over, so cardboard tubes were used instead. The last balancing lesson came with the head - sticking a box to the front unbalanced the robot, so an egg box on the top was decided on. 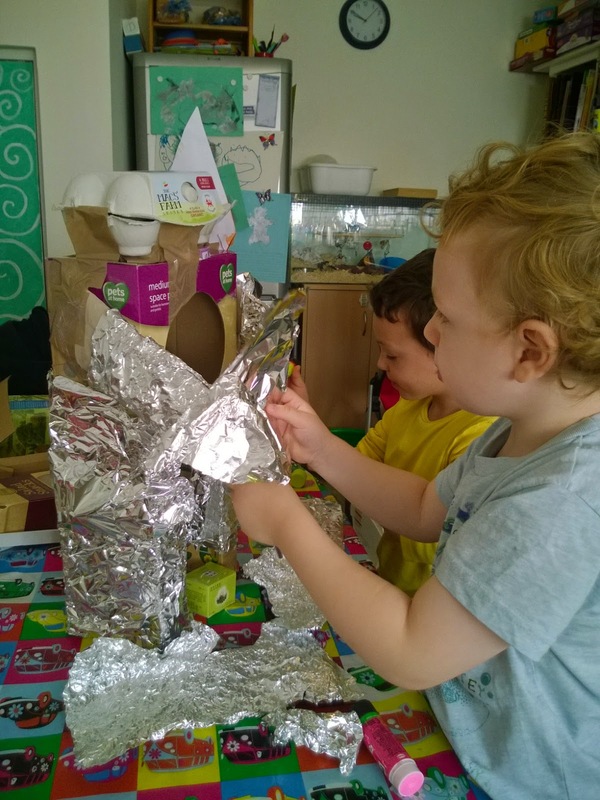 When happy with the shape, Ollie then pointed out that the robot needed to be metal, so I brought out the foil and the boys wrapped their robot. Ollie wanted to know how we could be tearing metal since metal is strong, so we talked about how the strength of a material is relative to it's thickness. He then wanted to know how it was made, so we had a quick search for a video of it being made - there's a great show 'How it's made' which has lots of episodes on YouTube - I searched 'How it's made Aluminium Foil' and quickly found a video showing how the big block of Aluminium had impurities removed, then was solidified again, the block of pure aluminium was then sent many times through heated rollers which pressed it to 5mm, before it was sent through cold rollers which pressed it to the very thin final product. The final stage of the robot was to make it move and think, but Ollie conceded that he would have to do that bit later when he was 'a bit older and bigger'. If you look at the actual skills involved though in this simple creative play session it's impressive what kids this age achieve. 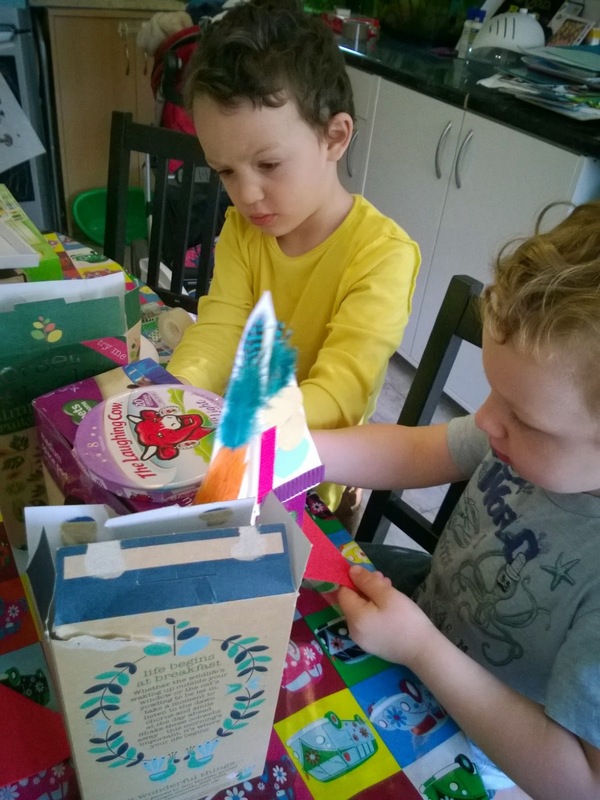 They have worked cooperatively and with a high degree of perseverance to produce a toy that looks the way they want and can stand up without falling over - the ability to make an object balance requires an understanding of weight, shape and forces (even if they wouldn't know by these terms that this is what they know). When something didn't work they searched for a solution both by trial and error and by using their existing knowledge from previous play. 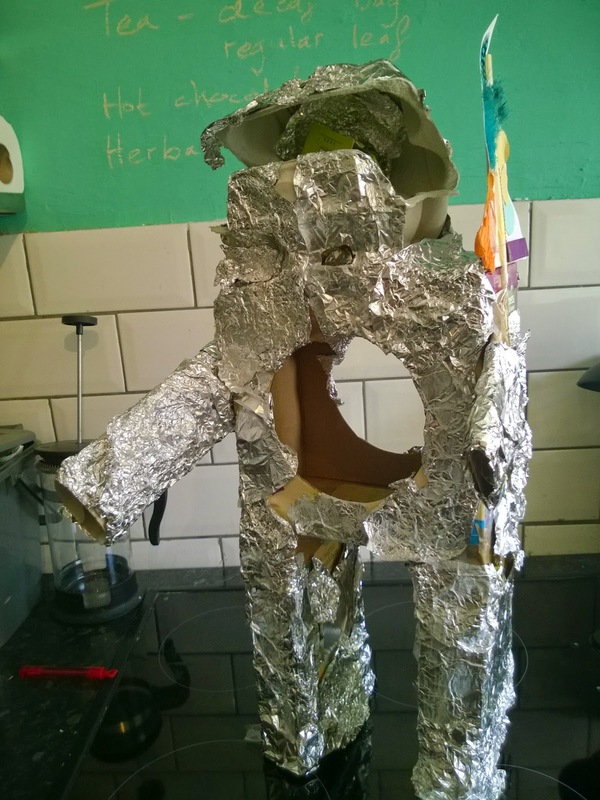 They used their imagination to visualize what they thought a robot should look like, then tried things out until they found a configuration that both looked like their imagined robot and was structurally strong enough to play with. They researched materials. They even seemed to understand that this was a prototype and would require further development when they had greater knowledge and skills in the future. This is no different to what a design engineer or a host of other STEM professionals do in their jobs. I've chucked a lot of analytic words at describing what they were doing, not to look like I'm over analysing every element of children's play but rather to give an idea of the fact that play is science, and science is play, so lets raise kids who are confident tinkerers and understand that STEM careers are just as fun and accessible to them as any of the other fantastic professions they could aspire to.